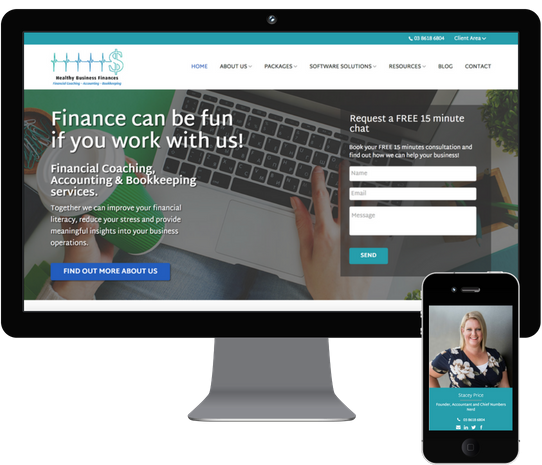 Early in 2017 Bizink launched a brand new website for Stacey Price of Healthy Business Finances. We sat down with her in mid-2018 to see how the site was tracking and get her feedback. “I had three websites before Bizink. I found it hard using people who didn’t understand all the pieces of the puzzle. Before Bizink, we didn’t have a page about Xero, MYOB or QBO. I went with Bizink because I thought this is what these guys do, they understand the market and they understand what we need,” Stacey said. The team at Healthy Business Finances are proud of their site. “It looks a lot more professional now. It’s not that we were embarrassed before but now people can look at it and see these people know what they’re talking about. Stacey told us how their accounting website plays a pivotal part in the industry recognition they’ve received. “Our website has also been important for award applications. If we put in an application then they can see that we’re a fun bunch of people but we’re still professional, polished and streamlined” she said. Healthy Business Finances are nominated for Bookkeeper of the Year, Employer of the Year and EA of the year in the Women in Finance Awards and are also finalists in the Ausmumpreneur award for Business Services… so it’s safe to say they’re kicking goals! Bizink provides a library content in the backend of our websites, all you need to do is hit publish and you’ve got your blog and social media sorted. “The blogs are a big thing for me! We use a combination of our own and the ones Bizink writes. When I have the inspiration I’ll write something but it’s nice to know if I don’t have anything then I can just log in and push something out” Stacey said. “I go in and edit the blogs to use my type of language but the main body is there. I schedule them for the month so there’s always something going out. There’s nothing worse than seeing the last blog on someone’s site was May 2017” Stacey explained. Bizink sites also have a Resource Centre which includes calculators, tools, business plan diagnostics and other business content. They’re great lead magnets and conversation starters with both clients and prospects. Healthy Business Finances is different from most practices. You get a sense of this right from the home page as the first thing you read is “Finance can be fun if you work with us!” They have also incorporated a team page and videos across the site to help convey their personality even more. They get around half of their clients from social media so Stacey explained their social media strategy to us, which is based around planning. Stacey understands that the key is getting the messaging right. “It’s about understanding that nobody is on Facebook and Instagram to get accounting help. But if something pops up that speaks to them, it gets them interested. We talk about accounting and bookkeeping still but not in the normal way, we make it a little fun so when people are flicking they want to read more.” Stacey said. “You need to flip it and think about what the client wants” she added. Another cool feature on the Healthy Business Finances site is the pricing page. “We made the decision to put our prices on there and I love it. We can just redirect people to those pages, it saves going back and forth on email with a potential client. We’ve found it also gets rid of those clients who want to squabble over $20.” Stacey said. Check out the Healthy Business Finances website for yourself.